On Sunday, Puerto Rico holds its primary. Talk about a primary no one five months ago thought would matter. But like a string of other states and territories, Puerto Rico has benefited from this hard-fought primary season. It rained on Hillary Clinton's parade. Will Puerto Ricans boycott presidential primary? BUT THERE ARE people in Puerto Rico who think the ultimate statement is one they can make towards the candidates – ignore both of them. Why, they wonder, should they take any interest in the U.S. presidential primaries when they don’t get any say in the general election, or any representation in Congress? Of course, Puerto Ricans want to protect their own culture, their own language, their own candidate in Miss Universe competitions, which they've won an extraordinary five times. And most mainland politicians seem more or less satisfied with the quasi-colonial status quo. So while on June 1st Puerto Ricans will exert more influence than they've ever had before in U.S. politics, by June 2, they'll still lack the right to vote for their commander-in-chief. Will Clinton or Obama be voted off the island? So even though Hillary, Bill and Chelsea Clinton have spent enough time wandering around Puerto Rico over the last few weeks that you could easily confuse them with tourists who got a good rate on a family vacation package, it's looking like the turnout for Sunday's primary won't hit the mark Clinton needs to take a lead in the popular vote before the Democratic campaign finally lurches to an end on Tuesday. Where the candidates see voters, Puerto Rico sees an opening. Local leaders, long frustrated by what they view as Washington's indifference, say the primary is a rare opportunity to focus American attention on island issues. Scott Simon talks with Gebe Martinez, contributing columnist to Politico.com, about the upcoming Puerto Rico Democratic primary and how the Hispanic vote could break down in an Obama-McCain race. Puerto Rico holds its primary on June 1. I just got off the phone with a pro-Obama PDP leader in Puerto Rico. He told me that they expect turnout to be low, as low as 200,000. A dos días de la primaria demócrata en Puerto Rico, resuenan con más fuerza las voces de políticos, religiosos y artistas llamando a un boicot. Sus razones para no acudir a las urnas son variadas, destacándose los que entienden que las primarias estadounidenses son un proceso ajeno a la realidad de Puerto Rico, un territorio estadounidense desde el 1898. The Puerto Rican vote in New York is large but nondecisive. The Hispanic vote in Florida could be the swing vote in a swing state. Obama now knows what Carl Rove found out in 2000. So you see Don Pedro Albeizu Campos and his Cuban counterpart Antonio Maceo are true heroes to conscious black Americans who are aware of how our own black history transcends national boundaries and must include the Afro-Spanish, Afro-Brazilians (and Afro-Dutch, Afro-French and others of the African diaspora) who number over 200 million souls all over Latin America. El aclamado actor puertorriqueño Benicio del Toro respaldó el viernes a Barack Obama en sus aspiraciones a la candidatura presidencial por el Partido Demócrata. More to the point, though, Clinton isn't especially liked in Puerto Rico. La congresista puertorriqueña Nydia Velázquez ve con buenos ojos que Hillary Clinton y Barack Obama compartan la papeleta del Partido Demócrata, uno como aspirante a la presidencia y el otro a la vicepresidencia de Estados Unidos. Sen. Hillary Clinton is spending her second straight weekend campaigning in Puerto Rico before the island territory's June 1 primary. It could be one of her last chances to boost her popular vote total. Flavio Cumpiano, Executive Director of the Puerto Rican Federal Affairs Administration talks with The Hill about the Democratic Presidential Primary in Puerto Rico. For Puerto Rico, the Democratic primary has revived the island’s ongoing dilemma over whether to become the fifty-first American state or remain a territory. It's a sign of Puerto Rico's zany political scene that a famous comedian sometimes doubles as a pundit. Silverio Pérez, known for hosting TV shows on Telemundo and Univisión, is also unusual for another reason: he's an independentista, one of the small percentage of Puerto Ricans who advocate for the island to become independent, ending its 110-year history as a U.S. possession. More than 20 stars from the Latin music and film community released a Spanish-language video in support of Democratic presidential candidate Barack Obama on Thursday, days before Puerto Rico's primary. The video, "Podemos con Obama," or "We can With Obama," features such Puerto Ricans as actor John Leguizamo and hip hop artist Don Omar, and international pop stars Alejandro Sanz and Paulina Rubio. Actors George Lopez and Jessica Alba also participated. This isn't to say that watching the candidates on television swigging Presidente beer or jigging to island music wasn't amusing. To this Puerto Rican, there's something mildly uplifting about seeing presidential wannabes making nice with Latinos on something other than immigration. This just in: Ricky Martin, the Latin singing sensation, has endorsed Hillary Clinton in advance of next week’s Democratic Presidential Primary in Puerto Rico. The entertainer has a good sense of timing – he’s doing his number right before the curtain comes down. I was born on an island, and I understand that food, gas, and everything costs more. Puerto Rico has a right to a better future. My plan offers new incentives to replace the 40,000 jobs that have been lost. And invest in the education of Puerto Rican children. On June 1st, it would be an honor to count on your vote. The Pew Hispanic Center today released a fact sheet on the demographics of eligible voters in the Commonwealth of Puerto Rico. The fact sheet contains information on elections in Puerto Rico and data on the size and social and economic characteristics of the Puerto Rican eligible voter population. This fact sheet is based on the Center's tabulations of the Census Bureau's 2006 Puerto Rico Community Survey. Local elections routinely attract 80 percent of voters. And the Democratic primary is open to all registered voters of whatever party, because Puerto Rico doesn't register voters by party. Nevertheless, electoral officials predict fewer than 25 percent of the 2.3 million registered voters will turn out for Sunday's primary. Puerto Rico: Apatía hacia la primaria: Muchos alcaldes del PNP son republicanos. La movilización de electores a las urnas para la primaria de este domingo dependerá de la capacidad de los políticos locales en superar la apatía que tienen en sus filas: la gran mayoría de los alcaldes penepés son republicanos y algunos de sus homólogos populares no aplauden este proceso. Thus, 32-23 Clinton on the delegates, a plus 9 in the delegate count for Clinton. This is based on Clinton winning by 57-43. My prediction today. Clinton picks up about 75,000 in the popular vote. “Ich bin ein Berliner”, was how John F. Kennedy in 1963, during the height of the Cold War, sought to reaffirm US support towards democratic West Germany shortly after the construction of the Berlin Wall. ALP: "Squeezed" and "Fighting for "Puerto Rico"
The American Leadership is an independent pro-Clinton group that has been running ads on her behalf. Pop star Ricky Martin is backing Hillary Rodham Clinton ahead of Puerto Rico's primary on Sunday. The Grammy-winning singer on Wednesday said Clinton has shown a commitment to the needs of the Hispanic community. Martin is one of the territory's top-selling artists, whose hits including "She Bangs" and "Livin' la Vida Loca." There are a number of reasons why the Puerto Rican Democratic primary election set for this coming Sunday won’t matter, in terms of Hillary Clinton’s failed bid for the party’s nomination. When Puerto Rico Democrats go to the polls Sunday for its potentially historic primary, CNN will be the only network to have access to exit polling. [A] stop-by-stop diary of Hillary Clinton campaigning in Puerto Rico over the weekend from our campaign reporter who followed Clinton on the trip. A new poll confirms that Hillary Clinton is the clear favorite in this weekend's Puerto Rico primary, but perhaps not by the runaway margin that her supporters have been hoping for. A broad coalition of activists will gather Wednesday, May 28 in New York City to express support for Puerto Rico's embattled teachers and schoolchildren, to protest the decision of SEIU's leadership to launch an attack on the existing teachers union and to exhort SEIU to cease this activity. [Clinton and Obama] have received lukewarm receptions from islanders, who generally do not identify with any mainland party and who do not have the right to vote in November's presidential election. Obama ready to crush Hillary with secret stash of superdelegates? The secret stash is designed to put [Obama] over the 2,025 mark or, if the magic number gets bumped up this weekend, to propel him to an even wider overall delegate lead, which will come in handy for spin purposes if, as expected, she blows him out in Puerto Rico this weekend. McCain has a BIG Hispanic Problem, Obama doing well. The media has been trying and make a story out of Obama's low Hispanic vote turnout. They assume that since he lost the vote in many states, that he will lose the vote in Nov. I can not emphisis how stupid of an argument this is. We've seen the argument made with "whites," until Obama won the demographic in Oregon, only after winning Iowa, Wisconsin, Utah, Washington... you get the idea. Once again the media isn't doing it's job of conducting journalistic research. Here's what the real story is on Obama and the Hispanic vote. 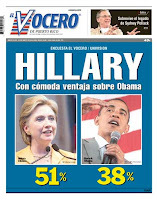 In a poll of Puerto Rico voters published today in the island's El Vocero daily, Hillary Clinton holds a 13 point advantage Barack Obama with just days before Puerto Rico's June 1st primary -- 51% to 38%. If accurate, Hillary will easily win the Puerto Rico derby. 1) The Vocero poll is a co-production with Univison, a NYC and Miami-based Spanish-language television company owned by staunch Clinton partisan and financial backer Haim Saban. 2) The Vocero poll article is curiously missing basic poll information, including sample size, margin of error, and actual groups surveyed (residents, registered voter, likely voters, etc.). A search of the Univision and Univision PR websites turned up empty. Unfortunately, without the poll's particulars there's no way to properly judge the information presented--and that information/data could be inaccurate, misleading or worse. For example, the poll found that only 43% of respondents will definitely vote, but it's not clear if those are the views of the general public, registered voters or likely voters--my guess is that it's of the general public. It's also not clear if the 51% favoring Hillary and the 38% favoring Obama reflects the views of the whole surveyed group or of a subgroup such 'likely voters'. 3) It's clear from my viewing of Univision's coverage of the Clinton-Obama contest that the network favors Clinton. For example, it was Univision's late minute debate "offer" that has been used to score cheap political points against Barack Obama, and it was Univision that has given Hillary a pass on her flip-flopping on licenses for undocumented workers, militarizing the US-Mexico border, the Iraq War, etc. For argument's sake, let's assume that the poll is accurate and the people surveyed are registered voters. If 100% of the 43% planning to vote vote, a bit over 1 million islanders will cast votes on Sunday. If they vote in accordance with the poll results, Hillary will receive 510,000 votes to Obama's 380,000. A big victory but not enough to erase Obama's hefty delegate advantage. Obama will end June 1st about 22 delegates short of winning the nomination, while Hillary will be short about 210. Favored in the final primaries of June 3rd in Montana and South Dakota, Obama will win the necessary 2025 delegates and lock-up the nomination. Hillary will be the official loser. But so will be Puerto Rico if the voters of the commonwealth miss an historic opportunity to vote for true change. W's former White House Press Secretary Scott McCellan's book, "What Happened: Inside the Bush White House and Washington's Culture of Deception", was released and it's causing a political firestorm. President Bush and his West Wing spinners LIED about Iraq. They repeatedly "shaded the truth"--i.e., lied--in order to ensure that war with Iraq was the only option. McClellan's motivation for writing the book? "Like many Americans, I am concerned about the poisonous atmosphere in Washington. I wanted to take readers inside the White House and provide them an open and honest look at how things went off course and what can be learned from it. Hopefully in some small way it will contribute to changing Washington for the better and move us beyond the hyper-partisan environment that has permeated Washington over the past 15 years." His conclusion about the Iraq War? "What I do know is that war should only be waged when necessary, and the Iraq war was not necessary." Thanks for waiting so long to tell us. BTW: Good job, Scotty. Hey, doesn't this "revelation" make Hillary and her Senate colleagues who voted for the Iraq War even bigger dupes? Perhaps more importantly, where was the press? We know that FOX has been a 24/7 propaganda outlet, but what about the television networks and newspapers? Why were so many of them so easily manipulated? And where--praytell--is the public outcry? Afterall, 4,000 Americans and 100,000 Iraqis--and counting--have died in a war based on lies. Puerto Rico won't be a swing state in November. It's not even a state, and its 4 million residents aren't allowed to vote in the general election. Its partisan politics have little in common with the mainland's; the main competitors are not Democrats and Republicans, but "commonwealthers" and "statehooders," and while they are divided into reds and blues, the reds of the commonwealth party are more likely to favor Democrats, while the blues of the statehood party skew more Republican. The close race for the Democratic presidential nomination has unexpectedly put Puerto Rico — and its 63 delegates — in the spotlight. Political analyst Juan Manuel Garcia Passalacqua talks with Alex Chadwick about the climate leading up Tuesday's primary. Well, despite his tiredness, he charmed the pants off the island. The front pages this morning had full page pictures of his beaming smile and crowds of people. 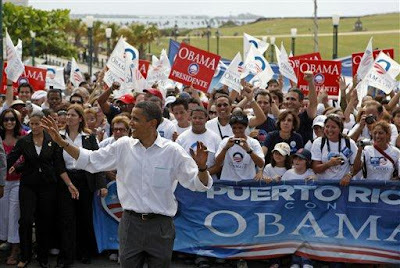 The headline in El Nuevo Dia was Obama Enchants Puerto Rico: Walks through San Juan, Dances Salsa. Meanwhile the headline for Hillary's visit was Hillary brings an Avalanche of Promises. Leaders of Puerto Rico‘s independence party predict a low turnout for Sunday‘s Democratic primary. "Puerto Rico should support Hillary because she understands you better," Bill Clinton told the crowd. Eager to put her controversial remarks about Robert Kennedy's assassination behind her, Sen. Hillary Clinton took off to Puerto Rico this weekend, where she shimmied to Enrique Iglesias, swigged from a bottle of Presidente beer and once again proclaimed her determination to continue her longshot campaign. Oscar-winner Benicio Del Toro won Cannes' Best Actor award Sunday for his role as "Che" Guevara in Steven Soderbergh's film on the revolutionary hero. Benicio was born in San German, Puerto Rico but grew up in Santurce, Puerto Rico, the son of Gustavo Adolfo del Toro Bermúdez and Fausta Sánchez Rivera, who were both lawyers. When he was nine years old, his mother died of hepatitis. At the age of thirteen, Benicio's father moved his two sons to Mercersburg, Pennsylvania. "There isn't anything we cannot do together if we seek God's blessing and if we stay committed and are not deterred by the setbacks that often fall in every life." In his remarks to a small group of veterans Saturday, Obama criticized the presumptive Republican presidential nominee John McCain for opposing legislation that would provide college scholarships to people who have served in the U.S. military. When it comes to Puerto Rico, the presidential candidates want to have it both ways. A few things struck me about this. Number one, race isn’t an “obstacle,” racism is an obstacle. The problem isn’t that Obama is black, the problem is that some folks have a problem with the fact that Obama is black. The beats of salsa and reggaeton were pulsing, the sun was shining and the waves of the Atlantic were rippling in the distance when Senator Barack Obama walked into La Plaza del Quinto to greet supporters one week before the Democratic presidential primary here. U.S. presidential candidates don’t often make it to Puerto Rico, so the language barrier is not usually a problem. The Road to the White House Goes Through Puerto Rico? Who would have thought that seventeen months into this nomination process, the two leading Democratic presidential nominees are battling it out in – Puerto Rico? Both Hillary Clinton and Barack Obama have taken their campaigns to a territory with no constitutional right to vote in the general election and an island where the residents are not required to pay federal income taxes. "Hóla, Puerto Rico! How's everybody doing today?" Obama shouted to a crowd gathered in Old San Juan, before he led dancing supporters along the seaside battlements for a raucous caminata, the traditional candidate parade. "I am thankful, I am grateful. . . . If we do well in Puerto Rico, there is no reason I will not be announcing that I am the Democratic nominee for president of the United States of America!" Clinton Greets Puerto Ricans: Buenas Noches! The throbbing beat of plena, blaring from a speaker truck, shook the Plaza del Quinto Centenario this afternoon as Barack Obama embarked on that most Puerto Rican of campaign appearances: the caminata. Barack Obama told veterans Saturday that he cannot understand why Republican John McCain opposes legislation that would provide college scholarships to people who have served in the U.S. military. Will Puerto Rico Determine the Dem Nominee? On June 1st, Puerto Rico will hold its primary, the third to last contest of this long and drawn out Democratic race. Barack Obama spent the day campaigning in the territory, hoping to reap some of its 55 pledged delegates up for grabs next Sunday. Barack Obama whipped up some Cuban-American leaders in Miami and an arena-sized crowd in Broward County on the last leg of a three-day tour kick-starting his presidential campaign in Florida. Yet even though Mrs. Clinton apologized for invoking the death of Senator Robert F. Kennedy on Friday — she said she was simply explaining how many races had gone on longer than hers, including in 1968, when Mr. Kennedy was killed in June — the reverberations have raised fresh questions about her motivations, overshadowing her campaign here and in the remaining two states. Barack Obama, campaigning today in Puerto Rico, pledged to improve health care and other assistance for the more than 150,000 military veterans living in the U.S. territory. My Tío Pablo, a Jibaro from Carite, served in Korea with the 65th. He was a Borinqueneer. Memorial Day is his day, too. I vaguely remember as a small child hearing him talk to the men about the 65th. I didn't understand what it all meant--other than it clearly meant a great deal to them. Forty years later, at his farmhouse on a Carite slope, Tío Pablo--his body riddled with multiple cancers--rested quietly waiting for the end. Framed above the bed was a photo of a young, vital Pablo in his 65th dress uniform and cap. A young Boricua, one of many braves, was sent to fight an enemy on the other side of the world. The Boricuas fought bravely--and a huge number of died. Afterward, many of the Boricua veterans followed Yankee buddies to U.S. Northern cities in search of their rewards. It was the 50's and the U.S. industrial machine was humming with the muscle of so many war veterans. Instead, too many Boricuas found low-paying, dangerous factory jobs, racism and long stints in VA hospitals to treat mysterious illnesses. Of course, that was Tío Pablo's experience. I always viewed Tío Pablo as a pretty smart man, proud, skilled--and so I always wondered why it was that he choose to return to Carite so early. He was may be in his early 30s. 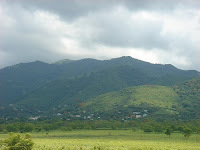 There on our ancestral land--still referred to as El Conuco and the rise above--Tío Pablo spent the rest of his days as a man of the land. Never a rich man, Tío Pablo confided that he had all he needed: his wife, Tía Irene; his land; his health--even when it was failing; and his freedom. We know that many of you have been anxiously awaiting the re-broadcast of THE BORINQUENEERS in Puerto Rico. We are happy to report that the Spanish version “Los Borinqueños” will be broadcast on TUTV (Channels 6 and 3) on Sunday, May 25th at 8:30 p.m. in honor of Memorial Day. Please let your family and friends know! Sabemos que muchos en Puerto Rico han estado esperando ansiosamente por la transmission de THE BORINQUENEERS (“Los Borinqueños”). Nos complace informarles que TUTV (Canales 6 y 3) transmitirá nuevamente el documental “Los Borinqueños” el domingo, 25 de mayo a las 8:30 p.m. ¡No se olviden de dejarles saber a sus familiares y amistades! REMINDER – New York’s WNET (Channel 13) will re-broadcast on Tuesday, June 3rd at 8 p.m.
We do not know of any other broadcasts at this time in other cities. But you should call your local PBS station to inquire if THE BORINQUENEERS will be broadcast. If you know of any air dates, please let us know so we can announce it through the E-Newsletter and on our website. James Henry Webb is the man who took out the GOP's leading presidential in 2006, Virginia's George Allen, by defeating the popular former governor and incumbent U.S. Senator. A decorated war hero, author and Secretary of the Navy under Ronald Regan, Webb says he was compelled to run for public office for two reasons: 1) the Bush administration's strategic blunder in tying the U.S. military in Iraq during a "war against international terrorism that's global"; and 2) the shameful lack of national leadership in response to Katrina. Many Obama supporters and political pundits believe Webb is a near perfect VP choice for Obama. Here's a glimpse of the man from his recent visit to the Tonight Show with David Letterman. PR for Obama's summary of the daily presidential primary news published in PR´s papers, radio and TV. Obama, según fuentes de su campaña, será el primero en llegar. Su llegada está pautada para el viernes por la noche y se quedará hasta el sábado. Mientras, la campaña de Clinton ya confirmó que la senadora estará en la Isla desde el sábado hasta el lunes. Según se supo, su campaña espera que Clinton aterrice por Aguadilla. La primaria del 1 de junio se convierte este fin de semana en el centro de atracción de la contienda por la candidatura presidencial del Partido Demócrata con la llegada de los senadores Barack Obama y Hillary Clinton a la Isla, en búsqueda de los 55 delegados que elegirán los electores puertorriqueños ese día. El gobernador del estado de Nuevo México, Bill Richardson, junto al ex gobernador Rafael Hernández Colón, recorrieron hoy varias calles del casco urbano de esta ciudad pidiendo a todo el que se encontraban a su paso que votaran por Barack Obama en las primarias demócratas del primero de junio. Puertorrican politics are like latinamerican politics. You don't choose a party, you are born into one. We don’t root for our parties, we fight for them, we scream, we ruin family meetings talking politics. We like our candidate strong, with personality, we like them to hug us, kiss us, dance with us. We don't mind choosing women (we had a female governor), as long as they are strong women. If you are a nice guy, if you can't dole out the punishment, you are branded as a "mongo", literally a local slang that means flacid. The label mongo is a death. Forget placards, stoic bodyguards and formal rallies. To win Puerto Rico's presidential primary, both the Clinton and Obama camps are campaigning in the boisterous, face-to-face "boricua style" favored on this Caribbean island. La asignación de fondos públicos para la celebración de las primarias demócratas en Puerto Rico es inconstitucional porque no tendría “consecuencia legítima” alguna, ya que Barack Obama prácticamente alcanzó los delegados necesarios para obtener la nominación presidencial. Fotos de nuestra fotoblog sobre la visita de Michelle Obama en Puerto Rico. 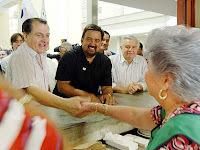 PHOTO: Governor Bill Richardson campaigning with formeer PR Governor Hernández Colón and Mayor Francisco Zayas Seijo in Ponce on behalf of Barack Obama. 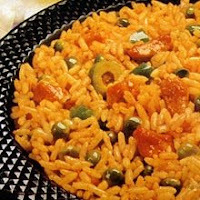 Anthropologist, Blogger and DailyKOS Diaryist Denise Oliver-Velez (aka Deoliver47) notes that "Most United States citizens here on the mainland know next to nothing about Puerto Rico, and yet we are headed towards a primary there on June 1." She then provides a comprehensive education on the Isla del Encanto, its people, politics and upcoming presidential primary. Very nice. 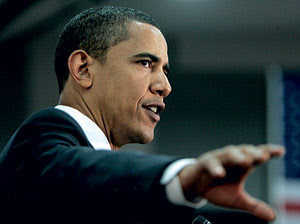 Obama is precisely the type of leader that the U.S. needs to guide it in the post American world. He is free from mind sets of the past and can relate better than any other to those that the U.S. must engage with due respect in order to bring about a world built on cooperation not on confrontation. Para el presidente del Senado, Kenneth McClintock, Puerto Rico ya está obteniendo ganancias de la primaria demócrata que tendrá lugar el 1 de junio en la Isla. Miguel Hernández Agosto, ex presidente del Partido Demócrata en Puerto Rico, anunció ayer su apoyo a la precandidatura presidencial de Barack Obama. “Obama entiende esta nueva realidad y puede detener el descenso de los Estados Unidos ante el mundo y de su poderío económico." Former presidential contender Bill Richardson will campaign this week for Barack Obama in Puerto Rico, 10 days before the Commonwealth holds its Democratic primary. Las primarias demócratas presidenciales en la isla, continúan al rojo vivo. En Decisión 2008, El Programa, Pedro Pierlusi -candidato a la Comisaría Residente por el PNP y co-presidente de la campaña de Barack Obama en P. R. - y Francisco Domeneche -líder local de Hillary Clinton y súper delegado- hablan sobre lo que esperan sean las tendencias en la Isla. The island's June 1 primary is the biggest Democratic contest left, with 55 delegates at stake and perhaps giving Sen. Hillary Clinton a last-gasp opportunity to claim victory in the popular vote. Mira este cartel que los admiradores de Barack lo colgó en la Clinica las Americas en San Juan. ¡Viva Barack! Update: Surprise! David Cook--and NOT Archuleta--took this year's American Idol crown. 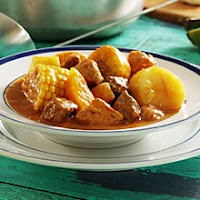 Congratulations to Cook, Archuleta and the other contenders for a terrific competition. The Miami-born balladeer, David Archuleta, has been the odds on favorite to win the American Idol singing competition. Tonight, AI fans will see the 17 year old virtuoso beat out rocker David Cook to win the coveted title and lucrative recording contract. 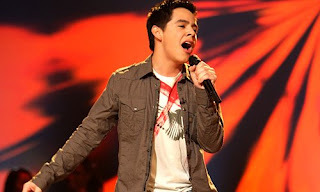 Archuleta's win makes him the first Idol winner of Latino heritage: David's father, James Jeffrey Archuleta, is Spanish heritage and his mother, Xiomara Guadalupe Mayorga, Honduran (Source: IMDB). A new Gallup Poll finds that Latino Democrats now favor Barack Obama over Hillary Clinton 51% to 44%. This is significant because Clinton has held a firm advantage with Latinos throughout most of the primary season. Moreover, the shift to Obama means that the McCain Campaign will have to work very hard to match the 44% of the Latino vote won by George W. Bush in 2000. Obama has won Oregon by a significant margin! More importantly, he has now won an absolute majority of pledged delegates. Much is being made by the Clintonistas and the FOX propagandists about Obama's low appeal to Whites. 1) No Democratic presidential candidate--and they've ALL been White--have won a majority of the so-called "White working-class voters" since 1964! And that includes Bubba himself! 2) A large number of Hillary's White voters vote Republican in nation elections--and few would vote for Hillary in the general election. 3) A larger percentage of Blue Dog Democrats voted for George W. Bush in 2004 than plan to vote for John McCain if Barack Obama is the nominee. Q: Who would bet against this guy? Warren Buffett--America's richest man--believes that the super-rich are NOT paying their fair share, and that the economy has been mismanaged by the Republicans. Oh...and he's donated his personal wealth to fighting disease and educating children. 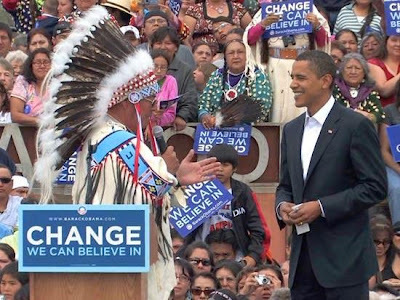 Barack Obama was adopted today into the Crow Nation in a ceremony in Billings, Montana. Representing the Crow Nation were Hartford "Sonny" and Mary Black Eagle. The United States government cannot undo wrongs against Indian peoples. But they can elect a president committed to do what's right for Native Americans. An U.S. presidential candidate strongly committed to doing right by Native Americans. Now that's change worth having! Yes, We Can! 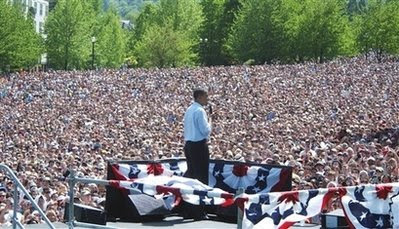 Barack Obama has been setting records for attendance at campaign events all season, but today's rally in Portland, Oregon was off the charts. 75,000 people gathered at Waterfront Park to catch a glimpse of the phenomena that is Obama. Note to the Clintonistas and the anti-Obama wingnuts: Oregon is 92% White and only 2% African American. Hmmmm. Eliana Cuevas is Canada's brilliant Latin recording artist. The youthful Venezuelan-born beauty's mesmerizing recordings moves the body and soul. Poetry and Rhythm - Subtle, strong, elegant, sophisticated yet simple and honest. She impresses with her strength but is never forceful. 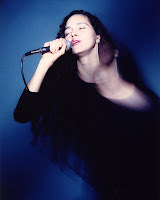 South American rhythms, poetry, jazz are all elements of her music which obviously flows from the core of her being. Eliana has many fabulous recordings, but Contigo may be my favorite. Political pundits and Clintonistas assume Hillary wins Puerto Rico running away. They cite as "evidence" three items: 1) Hillary's lock on New York Puerto Rican pols and votes; 2) Bill's pardoning of the FALN 16; 3) and a dated--and dubious--EL Nuevo Dia poll showing Hillary leading Obama by 13 points -- 50% to 37%. Nothing against the good people of the Bronx, but to suggest that voters in Puerto Rico will vote like Puerto Ricans in the Bronx is silly. Moreover, to suggest that because Hillary won a majority of "Hispanic" voters in California and Texas that, therefore, she'll win the "Hispanic" Puerto Rico vote as well is just dumb or worse. Puerto Rico is not East LA, San Antonio or even Miami. Much has happened since New York, California and Texas voters made their picks--and the evolving storyline is hugely different. Thank goodness! The scripted pageant of the Clintonistas, their allies in Miami and Los Angeles-based Spanish language television, and barrio Latino pols, has crashed with the rise of an authentic "people-power" movement known as Obama. With specific needs, challenges and opportunities of their own, Puerto Rico's voters have an historic opportunity on June 1st to tell the U.S. and the world whom they believe will make the better leader for their cause, the American nation's interests and the world. While the Clintons do have many supporters in Puerto Rico, Puerto Rico voters too are looking for change--and the Clintons don't measure up. For example, Hillary's pro-Iraq War vote, combined with her recent and irresponsible rhetoric about obliterating Iran, is like the stench of "naplam" to a people quite aware that their sons and daughters are dying at a disproportionate rate for a bad war. Additionally, the Clintons use of the race card against Obama and Hillary's claim that she's the go-to choice of bigots are views deeply offensive to the multi-racial nation that is Puerto Rico. Hillary simply CANNOT be the candidate of BOTH White bigots and Puerto Ricans. NO WAY! Believe or not, but NONE of the national polling companies tracking voter primary preferences has conducted a poll of Puerto Rico voters. The only "data" is from a dated survey conducted by the island's El Nuevo Dia newspaper in late March/early April. That poll had Hillary up 13 points with a margin of error of 4.4. With all due respect to the good people at El Nuevo Dia, not only is polling not their strong suit, but they have NO experience gauging local preferences for national candidates competing in a first ever true primary election. None. So one must take any poll there with a grain of salt. Additionally, the poll had a 4.4 margin of error, which means that the gap between Hillary and Obama back then could have been as little as 4.2 points. But more importantly, a political poll done in early April tells us nothing about voter preference today or on June 1st. Nothing. Nada. It's clear Barack Obama--and not Hillary Clinton--will be the Democratic Party 's nominee for president of the United States. Given this outcome, and given striking commonalities between Obama and the Puerto Rican nation--a multi-racial heritage, a balanced world view, awareness of the consequences of economic dislocation--island voters have an historic opportunity to vote Obama. The benefits of such an outcome would be huge for the people of Puerto Rico, an Obama Presidency and the cause for change. Pierluisi dijo que durante la reunión hablaron sobre "la política local", mientras que el grupo de campaña enfatizó a Obama que "Barack es un hombre justo y no es un político tradicional, que se identifica con el pobre de Puerto Rico y que será un excelente presidente". Pedro Pierluisi, quien encabeza la campaña de Obama en Puerto Rico, anunció hoy que el alcalde loiceño, Eddie Manso, y su homólogo de Añasco, Pablo Crespo, se unieron al grupo que apoya la candidatura del aspirante demócrata por las propuestas que presentó para la Isla. In the city's colonial district, Michelle Obama greeted the steering committee for her husband's campaign. She said only Puerto Ricans should decide whether the island will continue its commonwealth status, become a U.S. state or opt for independence. Chelsea Clinton is back in Puerto Rico stumping for her mother, Democratic presidential candidate Hillary Clinton. Not since those Vieques protests has Puerto Rico received so much attention from Washington politicians and the mainland media. Puerto Rico deserves to be heard in the Democratic race for President. As the chair of Barack Obama's campaign in Puerto Rico put it this week: "As a Puerto Rican I know this is our chance to engage the candidates on issues that matter to our island." On issues ranging from health care to the economy, the voters of Puerto Rico want to be heard. John McCain--the one time maverick Republican--has hitched his wagon big time to W's failed Iraq War and economic policies. A winning platform in the fall? I don't think so. However, McCain losing his bearing in pursuit of the presidency doesn't explain his lackadaisical attitude in regards to Katrina, the most horrific natural disaster on U.S. soil and W's single biggest domestic failure. Kossacks (Daily Kos bloggers) and pro-Obama partisans believe McCain's lackadaisical positions on Katrina and its aftermath will be a major issue in the fall election. It appears there's a quiet movement of young evangelicals turning away from the GOP. What is driving them out of the GOP? Polls have shown that young Christians aren't any less concerned about the "family values" issues that have traditionally driven Christians to the Republican camp. It's just that they're also concerned about issues such as social justice and immigration, issues traditionally associated with Democrats. What's interesting is that many aim to vote for Barack Obama for president over John McCain. Puerto Rico is bracing for its relevant presidential political primary ever. The event takes place June 1st. The following are articles and opinion pieces on this historic event. Si, Se Puede! Ironically, while Puerto Ricans may be pivotal for the selection of the Democratic presidential candidate, they will not be able to vote in November. "It is ironic that the colony may end up deciding who the president of the empire is going to be," said Juan Manuel Garcia Passalacqua, an author and commentator in San Juan. "Actually, it is absolutely amazing. Secondly, this primary will have nothing to do with Obama or Hillary. It will be very local, very Puerto Rican." What the candidates' position is on Puerto Rico's status (Commonwealth, Statehood, Independence), how much and how they campaign, and what issues they stress matter more than any "Hispanic vote" precedent in the 50 states. Obama's campaign vowed to create a task force to boost economic development and create jobs on the Caribbean island, which has a per capita income about half that of the poorest U.S. states. Sen. Hillary Rodham Clinton has enjoyed the support of Hispanics in Democratic presidential primaries earlier this year, but she may lack that support in Puerto Rico, according to Rafael Hernandez Colon, the island's former governor. Puerto Ricans, unlike other Latino groups have always had much more affinity with African Americans. Hearing the cry that Clinton doesn’t do as well in caucuses as she does in primaries, Puerto Rico has changed their caucus to a primary and moved up the date to June 1st. The levels of unemployment on the Island over the last three decades are unacceptable, which is why I will propose the creation a federal-Puerto Rico joint task force to study and report not later than August 31, 2009 on specific ways to maximize the use of existing federal initiatives to generate jobs in Puerto Rico or on new federal initiatives to achieve that goal. But on the ground, there is a growing swell of support for Hillary Clinton`s rival, Barack Obama. Pangea Day. Be part of this historic event as it unfolds around the globe. 4 hours of film, music, and speakers that will change the way you see the world. Some believe that Obama should take Hillary on as his VP because of her supposed strength in the general election among women and white working class people. Somehow, we're to ignore the fact that Hillary is an incredibly divisive person, has gargantuan negatives, and worse, has shown Obama no respect. Hillary as Obama's VP? No way! 1) A progressive Democrat in a very Republican state, Sebelius was elected there twice. 2) Unlike Hillary, Sebelius is very likable, has a calm, folksy, midwestern accent, and really has her pulse on the heartland of America. 3) Sebelius will have appeal throughout the Midwest and with many working class people. 4) Obama's state of Illinois borders Missouri and Sebelius's home state does as well, and together they may be able to win Missouri. 6) As a Catholic and a midwesterner who understands middle America--and does so a whole lot better Hillary, Sebelius helps Obama in Iowa, Wisconsin, Minnesota, Michigan, Ohio, Missouri, Pennsylvania, and could put Indiana in play. 7) As a strong woman with proven political skills, female voters will folck to support her historic quest to become the first female VP. 8) Sebelius doesn't hurt Obama anywhere, but solidifies the Midwest and beyond. 10) Americans typically turn to leaders from the heartland when the country's in trouble, and the smart, classy, accomplished, sensible and forward-thinking leaders from Illinois and Kansas fit the bill. "Meanwhile, Mr Obama attracts other voters in a way Mrs Clinton never has. For every white bigot who switches sides because of Mr Obama's skin colour, there is likely to be a white independent—especially a young one—running to support him. The data show that young people, both black and white, prefer Mr Obama. Against Mrs Clinton, Mr McCain might have swept up all the independents; with Mr Obama he will have to split them. Mr Obama has raised money from close to 1.5m individuals, far more than anybody else ever has. That will stand him and his party in good stead come November. Each of those donors will be working hard to make sure that their investment is not wasted: an army of footsoldiers to fight the Republicans." More than any other candidate this year, he has articulated an idea of a nobler America. That is partly because of who he is. Senator Barack Obama has won! He will be his party's nominee--and the next president of the United States of America. Not only has he withstood the Clinton Machine's "kitchen sink" assault of the last month, but he has also beaten back a vicious assault by the rightwing led by Rush Limbaugh and his Operation Chaos and radio/cable screecher Sean Hannity. Actually, it was fun watching an angry Hannity last night try desperately to piss on Obama's victory over the forces of evil. Now, even the Clintonistas have begun admitting that the contest for the Democratic Party presidential nomination is all but over. The only real question now is how Bill and Hillary step down while saving face. Speculation last night included everything from Obama absorbing the Clinton Machine's campaign debt--a mistake in my mind--to agreeing to a Clinton hand-picked VP--an even bigger mistake--to giving in on Clinton's favorite policy positions such as a summer gasoline tax holiday--OK, maybe I can live with that. The Clintons have cancelled all media and public appearances today as they strategtize on next steps. Key to their decision is gauging undecided super-delegates for more Clinton campaigning. The exit negotiations and the orchestration of a events which results in 1) the Clintons really stepping down and 2) lining up fully behind Barack Obama will be just as important as all that has come before. A major concern has to be that the Clintons--while pretending otherwise--will secretly undermine Obama's fall quest as they prepare for a 2nd Hillary bid in 2012. Obama has won the North Carolina Democratic Party Primary by double digits (56% to 42% w/83% of the vote). In addition to losing this critical battleground state, the Clintons "game changing" results failed to materialize. The Drudge Report has just posted that the Clintons will huddle with undecided super-delegates tomorrow to gauge if they can continue their campaign. Actually, the fact they these folks are still undecided about Hillary says it all. Great news! While the Clintons and their allies in Rightwing media mock Obama's call for change, former Speaker of the House and GOP strategist Next Gingrich is imploring House Republicans to seek "real change to avoid a real disaster". This is too funny. W has been a complete disaster. And leadership, vision or innovative ideas have in short supply in the U.S. House for years. But the idea that at this late point, the GOP House leadership and rank and file will finally get down to proposing real solutions to the country's problems--many created or made worse by a mean-spirited, elitist national GOP--is nuts! And Gingrich offers a summer gas tax holiday as a serious solution! On second thought there is something the House GOP could do which would be bold, helpful to the republic and could possibly ensure a John McCain victory: The House GOP could resign. BTW: Is there any doubt that a shameless Hillary dons the agent of change costume for the Fall--in the event the Clinton Machine steals the nomination? Lost in the noise that was this weekend's political "news" coverage was this small but important development: Senator Barack Obama win in Saturday's Guam Primary. The margin of victory was tiny--just 7 votes, and the number of delegates earned minute (2 each), but it WAS a win. And Obama won! He has now won 31 contests to Hillary's 15. Kalyn Free, member of the Choctaw Nation of Oklahoma and founder and President of INDN's List, has endorsed Senator Barack Obama. As a member of the Choctaw Nation of Oklahoma, I am proud of what it means to be an American Indian. I am proud Barack Obama is committed to our unique issues and willing to tackle our toughest problems, from historical inequities and injustices to contemporary issues, like protection of our right to tribal self-determination, access to health care for our elders, and education for our children. Despite the threats that have faced our culture and our people, hope has lifted Indian people through the most difficult times. Because we remain connected to our past, our culture and our communities, we never gave up that hope. May be this has something do to with why Kalyn has reached past Hillary. Hmmm. The Clintons dissing Native Americans. Sound familiar? And people think Hillary's "go-white and right" strategy is simply a tactical response to Obama's surge.